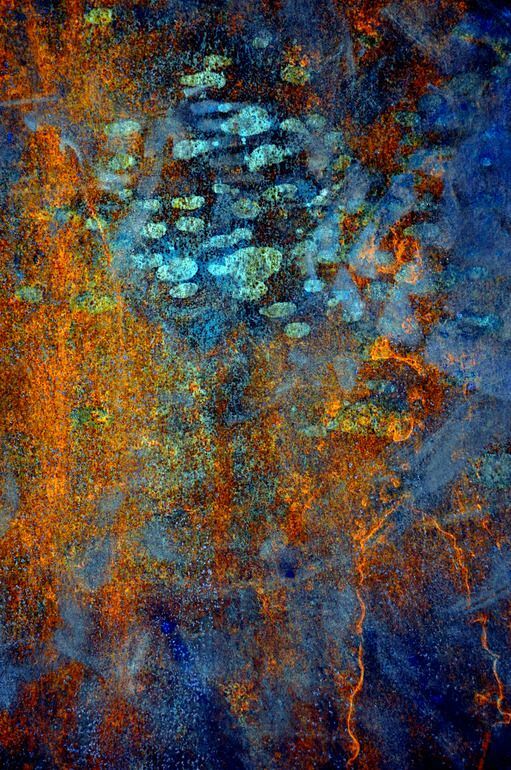 What is it about “dappled” things that so dazzles us? I ran across this poem, a favorite of mine, not long ago, and was reminded once again of how much nature inspires and excites us. Painters as well as poets have been praising that pied beauty through their artwork down the ages. 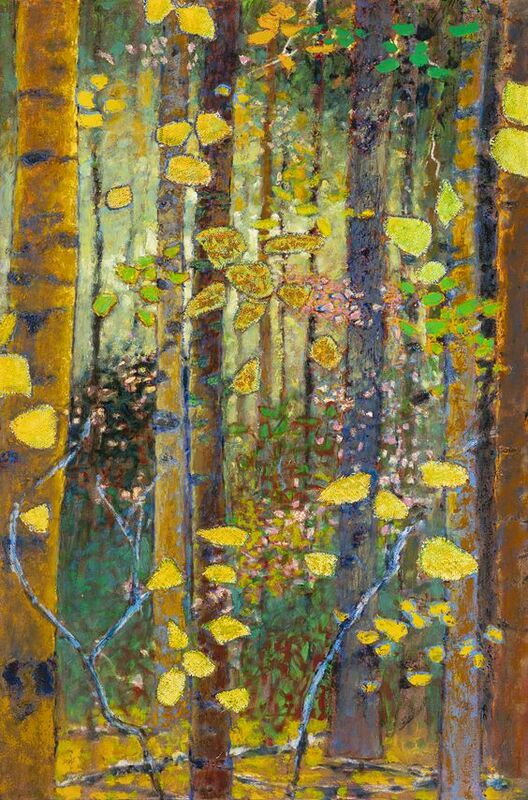 A few of my favorite paintings praising dappled things follows. I could have spent weeks savoring up all this museum has to offer, instead I had five hours. Still I was in heaven. The structure itself is a masterpiece, a renovated train station with a magnificent clock tower set on the Left Bank of the Seine River across from the Louvre. This was the most visitor-friendly art museum I visited in Europe. An enormous hall was surrounded by various rooms on several floors all flowing into one another. I was forever lost in the Louvre and the Prado, but here I always felt gently guided as I roamed from one room to another in my exploration of all the artwork. 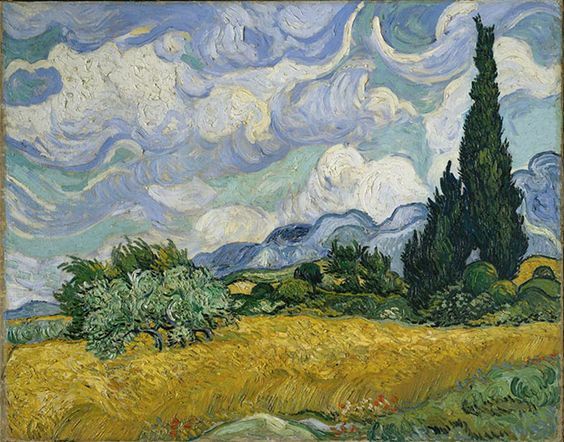 While the Louvre features art created before 1850, d’Orsay picks up from there, featuring an impressive array of Impressionists, both pre and post, including Van Gogh and Gauguin, Monet and Manet, Derain and Degas, Bonnard and Toulouse-Lautrec, Renoir and Cezanne, among others, along with a powerful selection of sculpture, and artwork less familiar to me. Below is a random sampling of some of the work I loved seeing. What I loved too was being able to get so close I could see the individual brush strokes. 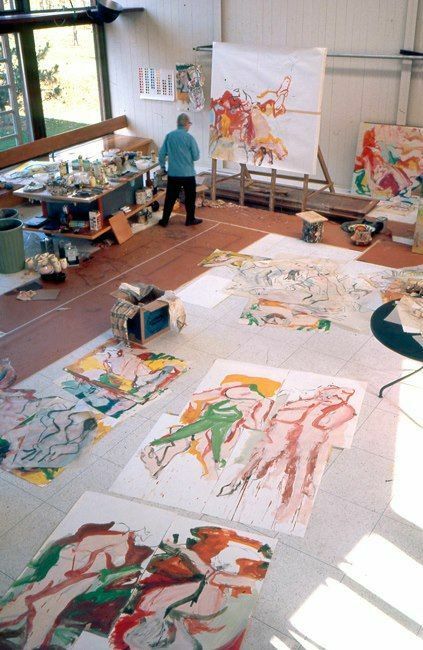 See if you can guess whose paintings these came from. These are just a fraction of the photos I took, which are a small fraction of all the wonderful artwork on display at the d’Orsay. 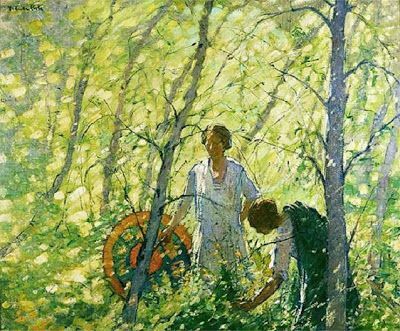 I leave you with a painting by only American I can remember seeing, although there may have been others. 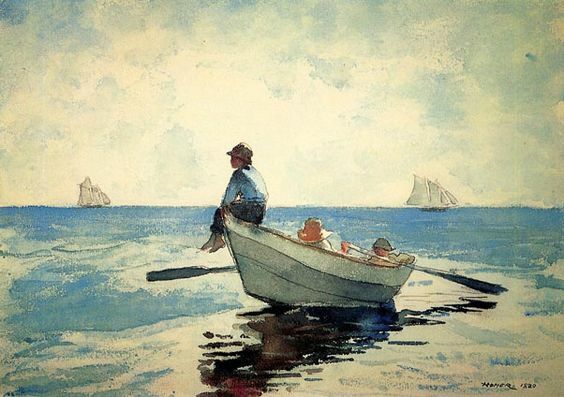 I was bewitched by this Winslow Homer I’d never seen before. It captures something of the enchantment I felt dancing in the arms of the masters on that magical day. 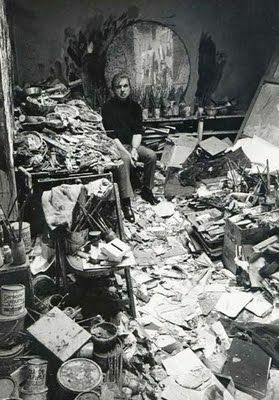 I’ve been collecting images of artist studios and writing spaces as inspiration for creating my own art/writing workspace. 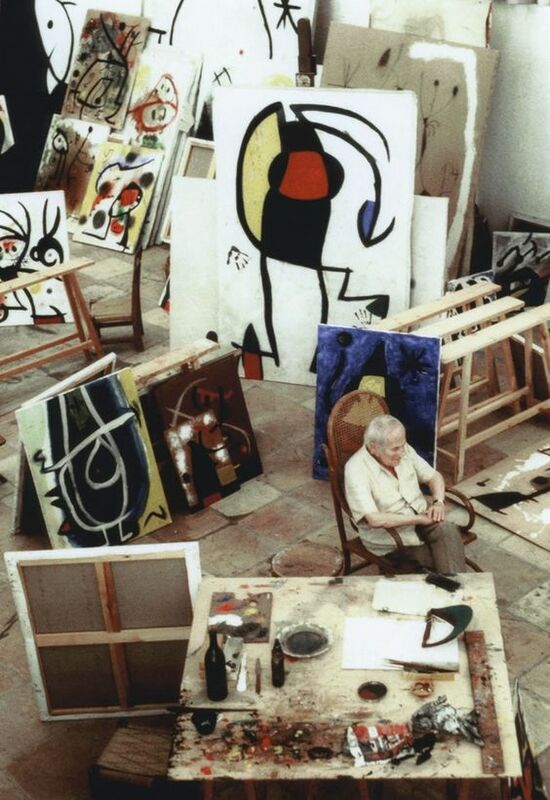 Some of these images are of famous artists and writers. 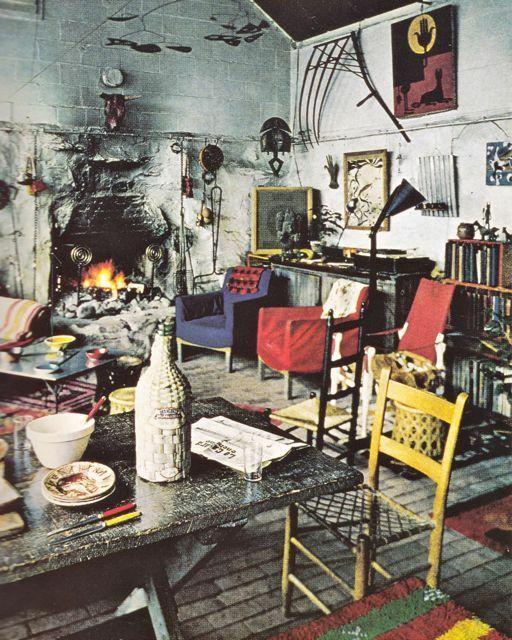 It’s been so interesting to match the creative mind with the space that inspires it. 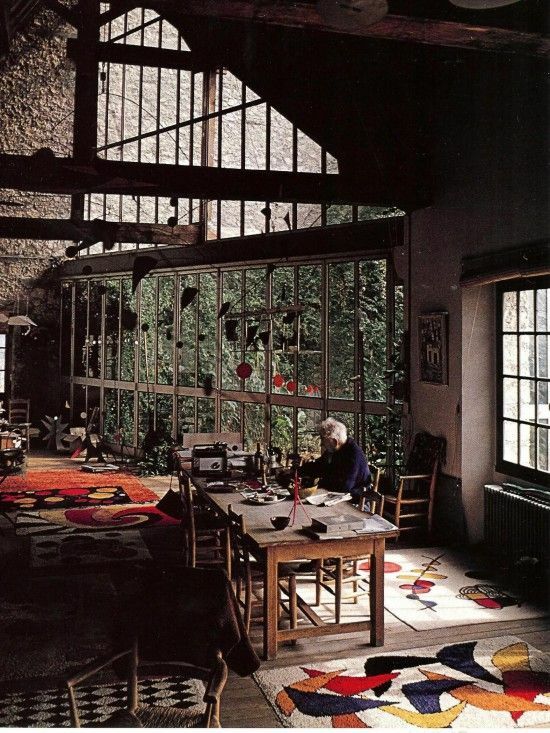 Most of the creative spaces that have been most inspiring to me belong to people who are not famous, or at least unknown to me, and perhaps I’ll share those another time. Here I’ve matched the spaces with famous quotes from the inhabitants. See if you can guess who they are. If you can’t, the names are listed below. 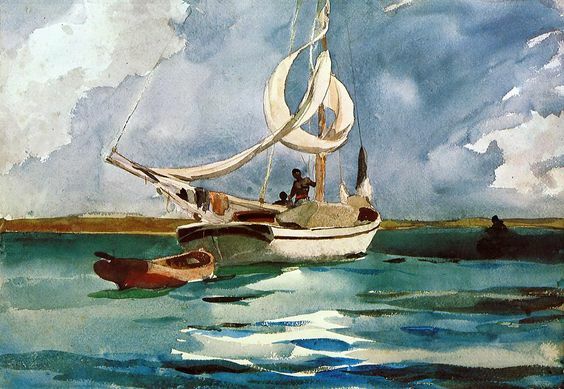 Recently I discovered the watercolors of John Singer Sargent and Winslow Homer, two great American artists that I had known primarily for their oil portraits and landscapes. 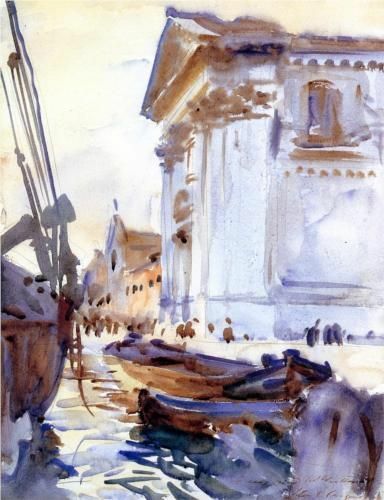 But each in their later years, especially when travelling (Sargent the to Mediterranean, Homer to the Key West and Bahamas) preferred painting in watercolor and created some astonishing works. 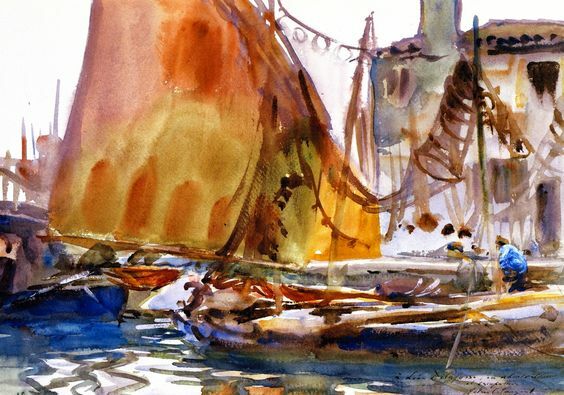 Each was drawn toward capturing the dazzling whites and blues of the sea, the lights and shadows and reflections thrown up on the hulls of boats and mirrored in the water. 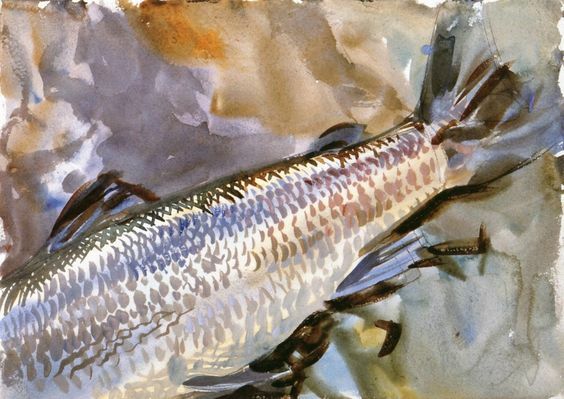 Sargent was born some 20 years after Homer and outlived him by about as much. But at the height of their careers their worked overlapped each other. 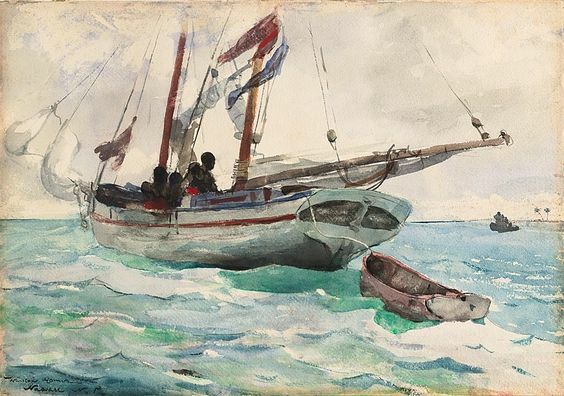 Yet while working in similar mediums (oil and watercolor) and drawn toward similar scenes (boats, the sea, light on water) their styles, while equally masterful, were unique. 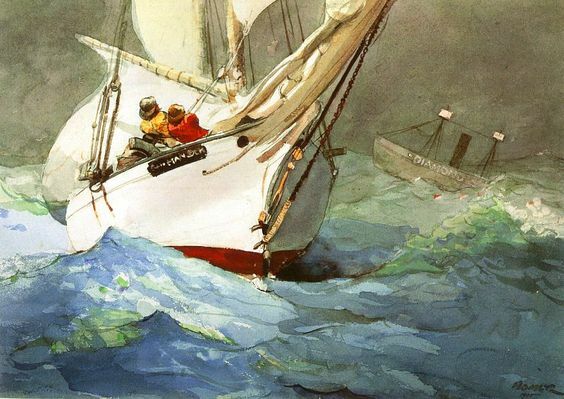 Each captured some unique aspect of the sailing experience, and each captured the spirit of the thing they were after. But they were after different things. I lived and sailed on the sea for many years, both in the tropics and the Mediterranean. I spent long days in tranquil coves and landless seas, as well as busy ports and colorful quay-sides. I know that balmy bliss and dreamy languidness. I know the thrill of that chaotic energy. 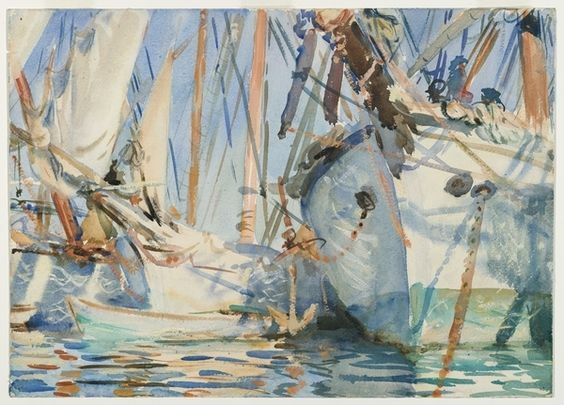 Sargent’s watercolors capture the boldness and busyness of the ports, the dazzling brightness as the sun dances across the hulls of ships and scatters into the sea, winks among the rigging and splashes upon the warm decks. 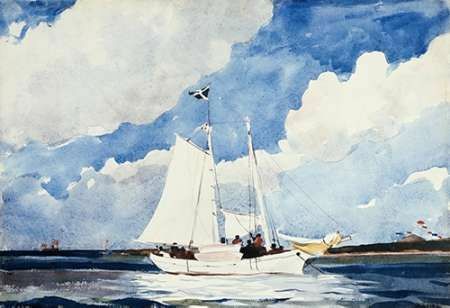 His paintings capture the sweeping rhythm of hull lines and mast tilts, of sails fluttering in the breeze above swaying decks. Immersed in that chaotic noise, the eye is too dazzled, too overcome with the busyness and beauty of it all to separate out all the chaotic details. 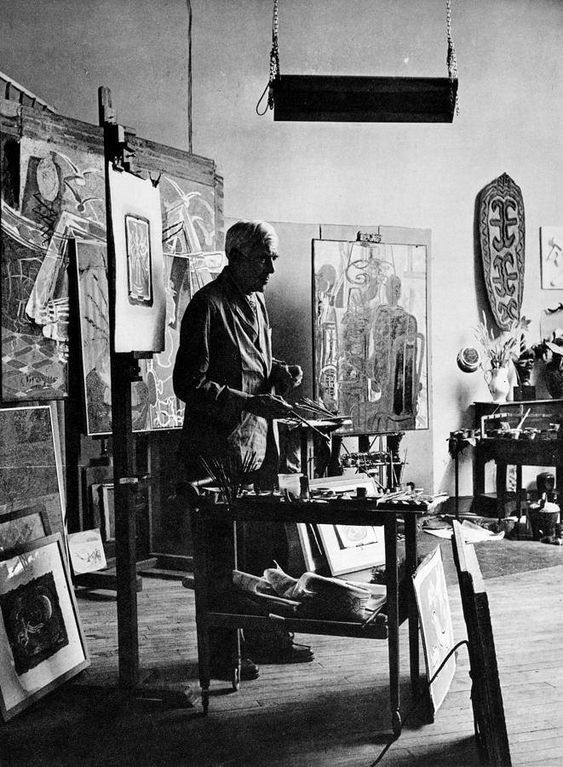 One sees only the mass and movement, the lines and curves, the dazzling light and cool shadows. 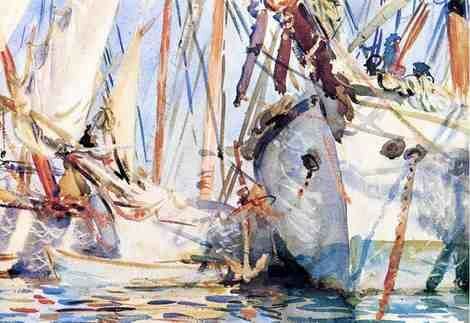 That is what Sargent captures in the watercolors here. Immersion in the moment. When I enter his scenes I’m immediately transported back in time. I’m there standing on the docks with him . . .
. . . or approaching the scene from a dinghy. I’m seeing what he sees, feeling what he feels. I am right there at the center of it all. Homer’s watercolor scenes have a different style and feel. There’s no “swagger,” no startling viewpoints. 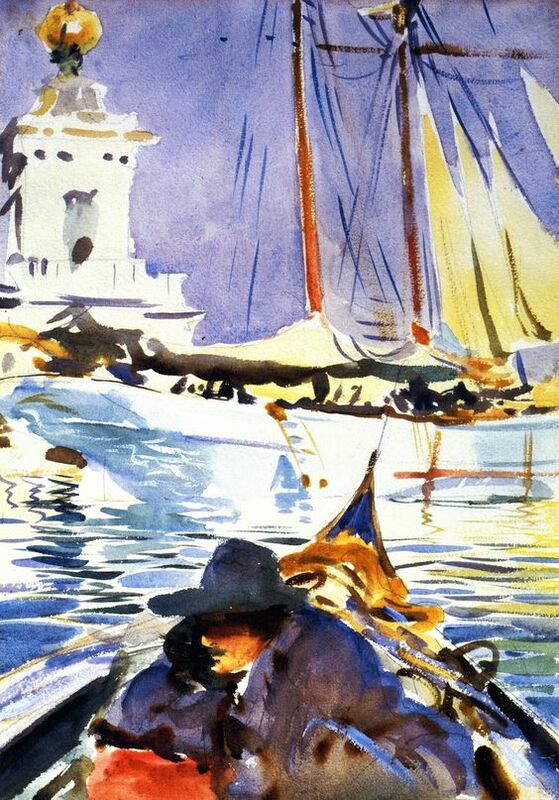 While Sargent’s watercolors have an abstract, impressionistic feel, Homer’s paintings feed a narrative. They aren’t so close up and chaotic. 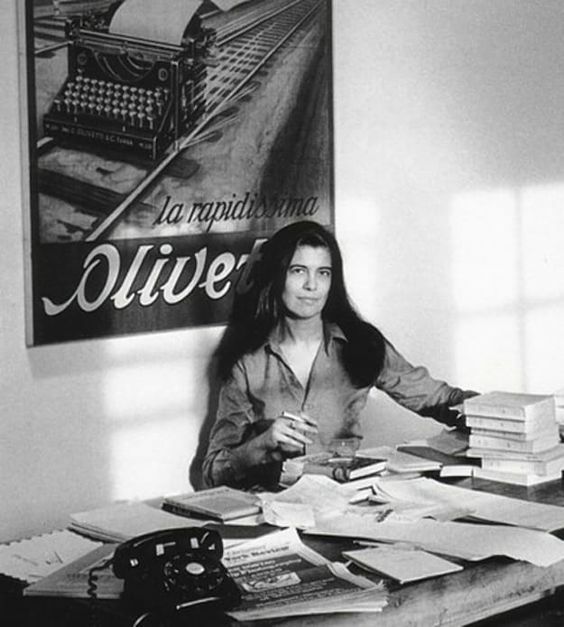 They have a writerly gaze. A “watching from a distance” feel. Rarely do you find a painting without people visible. Without the sense that you are watching a story unfold. You see the wide sweep of sky and sea. You feel the heavy humidity in those clouds and the heat from that dazzling brightness. You see a crowded deck with people raising sails. You see an unfamiliar distant vista. You see a story unfolding. 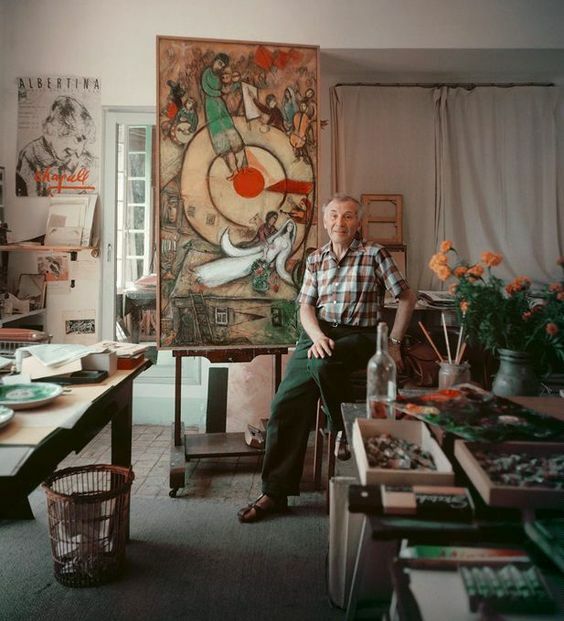 And while you see only one moment of that story, his paintings invite you to imagine more. In Homer’s painting, the viewer is right there–we feel the heat, the hot sky, the warm water, the hand gripping the deck–but like a reader immersed in another’s story, not like we are there personally ourselves. 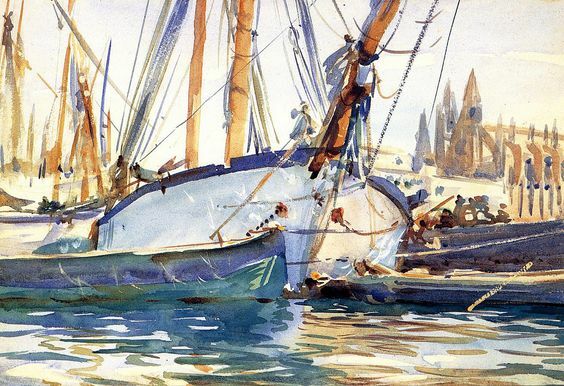 Homer’s paintings can be as exciting and full of movement as Sargent’s, as we see below. 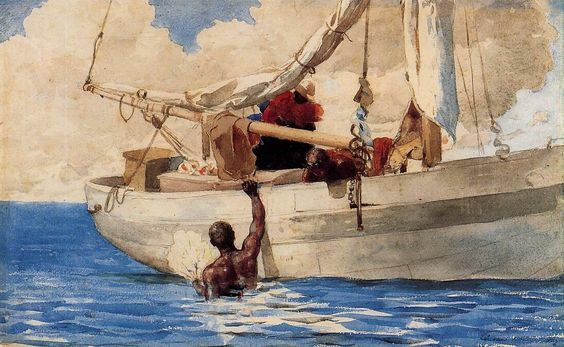 But Sargent’s are rarely as full of human drama and emotion as Homer’s. Or as dreamy and wistful. And that’s a criticism made of each. How so many of Sargent’s paintings, while artistically masterful, fail to evoke human emotion or even a sense of what he sees as “beautiful,” as one critic complains. 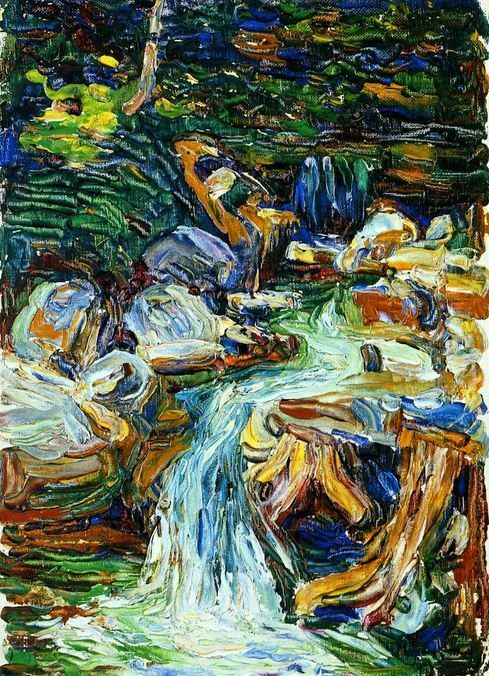 While on the other hand many of Homer’s paintings can be seen as nostalgic, or bordering on the sentimental. As for me, I see something I love in each. Both speak to me and my experience in powerful ways. 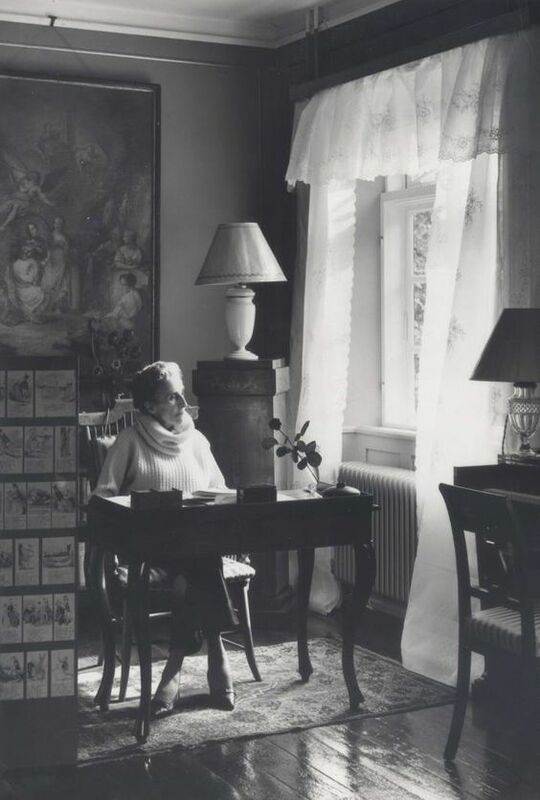 As we were sailing, every leg of our journey was a story unfolding, for my family personally, but also for those people and places we glimpsed along the way. We were voyeurs as well as voyages. We saw scenes unfolding around us that never came to a conclusion. Long lazy days and balmy nights invited us to wonder where they might lead. At the same time we were immersed in our very own chaotic and exciting sense-experiences, void of narrative, but full of feeling. We wafted between that abstract intensity and the dreamily nostalgic. As perhaps we all do, immersed in the moment as the long thread of our lives unfolds. Which artist speaks to you? Do you have a favorite among those shown today, or ones you’ve seen elsewhere? 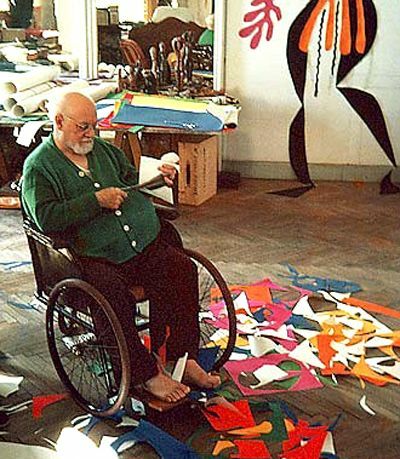 You can read more about these artists and see more of their works in the links below. 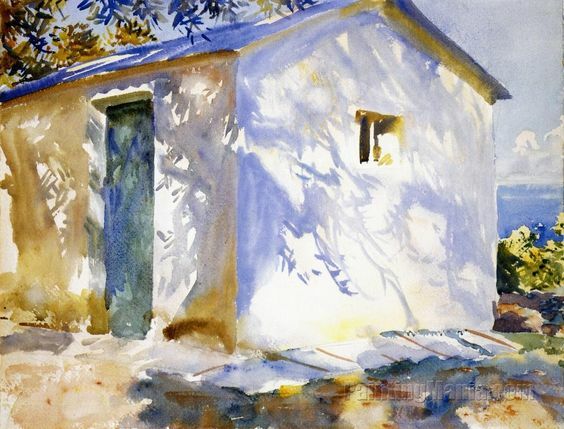 Capturing light in painting is one of the artist’s greatest challenges and deepest joys. I fell in love with the dazzling white lights in the paintings of Sorolla. And later the warm, buttery light that infuses Franz Bischoff’s California seascapes. I couldn’t help but be tempted to try my own hand at capturing even a fraction of the light they capture in their paintings. I knew I wouldn’t be able to come close, but you can learn so much from your failures. You learn what is possible, what doesn’t work, what your limits are, what you still need to learn. I decided to start by trying to capture some of that warm buttery feel in Bischoff’s paintings, before moving toward Sorolla’s dazzling white light. These first two attempts are from photographs I took on a trip to Big Sur at the Julia Pfeiffer Burns State Park along Highway 1. 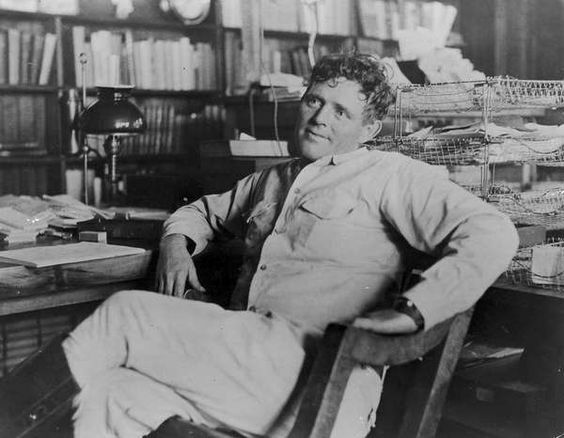 Before donating the land to the state, the original owners had a house on a bluff overlooking the ocean. These are the views from her home. On one side the coastline and Highway 1 snaking northward. to the south a private cove with an 80 foot waterfall. In their backyard are the redwoods. I can’t imagine what it must have been like to have lived in that magical place, to have woke each morning to these views from their windows. I’m not unhappy with the results. When I compare my paintings to photographs of his (below), I think I captured some of that warm, buttery glow. That encouraged me to try a study of one of my favorite Sorolla paintings, changing it slightly–a different boat and adding a swimmer snorkeling. I could not capture his dazzling white rocks, so I settled for a something more colorful, abstract. I’m happy enough with the results, although it’s nothing like Sorolla’s. His secret is still safe from me. Still, I’m more in awe of him now than before. His blues are so much deeper, his lights so much brighter. And his reflections! His colors! How does he do that? I get drunk on his colors. I want to dive in and live there. 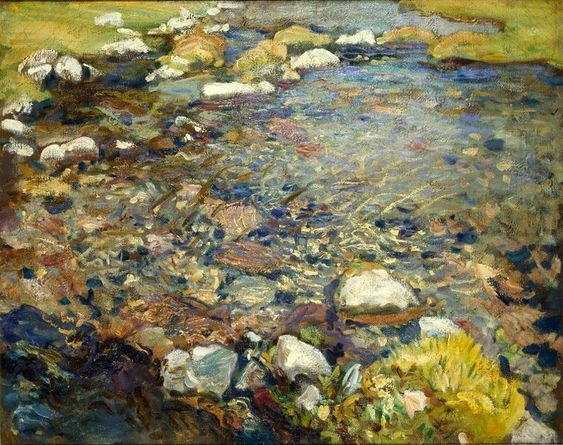 Here are links to more of Sorolla’s and Bischoff’s paintings where you can see them in greater detail. They are artists you could fall in love with. I did. I’m still playing with my painting, copying artists I love or using their vision, their palettes, for inspiration. Still trying to learn the art of painting and its craft. Trying to discover what I want to do with my painting, what I want to capture, and how. The two below were inspired by the paintings of Peter Doig. I think of them as “dreamscapes.” They are nothing like what you would really find in the tropics, and yet they capture what it feels like to be there at night in that dark/light denseness. The first I painted is a near likeness of one of his paintings. And I have to say I’m pleased with it. I like it almost as much as his, meaning that I recognize the quality of mine doesn’t match his, but it does capture, at least for me, the “feeling.” You can almost smell the humidity, the damp earth and folliage, feel the balmy stillness of night in the tropics. The second was inspired by his painting of the milky way reflected in water, but mine is not like his at all. I created a different version of the Milky way, and a different land and seascape below. It’s very much its own painting, and I’m pleased with it. The next two were inspired by Ann Oram’s paintings of the Mediterranean. The first is a close copy, mine in watercolor and ink, hers in pastel and ink. You can see her original at the top of this page. I liked the way she used candle wax as a “resist” to add texture to the rocks and water. I liked the way the ink defined splashes of color into buildings. I hadn’t used ink or wax before, and now have started using them in other paintings as well. The second is my own creation, and not as successful, I think. I wanted the cliffs in the foreground to be the focus, but I think I strayed from that. I’m not unhappy with what I created, but something doesn’t quite sit well with me. I’m not sure what’s off. Someone suggested the buildings on the far cliff are too large for the perspective, and she’s probably right. But even if I shortened them, I don’t think it would “fix” it. Maybe you have some ideas for me. Sometimes I have to sit with a painting for a long time before I see what I need to do to complete it. I put it up where I can see it whenever I enter the room, and stop to study from time to time. And slowly I come to realize, oh yes, that needs to be darker, that lightened, that edge hardened, that one softened. But sometimes, even after studying it for a long time, I realize this painting is as good as it gets, at least for now, and I put it away. I still don’t know what “my style” is when it comes to painting, or even my medium. I’ve been mixing collage and watercolor recently and will share some of that with you soon. Right now I just like playing, tying new things, discovering new artwork that I love. When I love it enough, it’s too tempting not to at least try to see if I can recreate something remotely similar. Most recently I’ve been trying to capture something of Sorolla’s light. I’ll share that attempt soon. Family and friends have been asking me to show them some of the watercolors I’ve been working on, so I posted a few on Facebook the other day. I thought when I first started that my painting would be “just for me” and not shared with the world at large. But it’s hard to keep things you love, that bring so much joy, to ourselves, it seems. And I’m curious to know what others think. I’m averaging one watercolor a week, and so far, all have been deemed “wall-worthy,” unlike the pastel paintings I worked on last year. My walls are filling up fast. A year from now, will there be any wall space left to fill? What a shame, I think. So much talent and beauty hidden from public view. Then I wonder what I’ll do when my own walls are full. How soon will I need a storage shed? What a think to worry about! Especially when I’m having so much fun, and when there’s still so much I want to paint. I have at least a dozen paintings in my head that I want to get on paper. And there’s more inspiration every time I go to my Pinterest boards and view all the amazing artwork I’ve collected there. Which brings me back to this blog. Perhaps I will start sharing some of my work here, despite what I wrote in a previous blog post about my painting being “just for me.” I’ll start by sharing my first three watercolors, which already have a place of prominence on a bathroom wall. They were inspired by photographs taken when we were sailing on La Gitana. I’m planning a whole series of tropical paintings–seascapes, boatscapes, landscapes, all from our travels. Lately though I’ve become sidetracked from the sea to try my hand at some more impressionistic or symbolic paintings, as well as some florals and still lifes. I’m still experimenting with style, you see. While I admire realistic, representational painting, and I think it’s so important to be able to do this kind of painting well, I find myself drawn to a looser, more imaginative style that captures the essence of things with all its attending emotions and conotations. 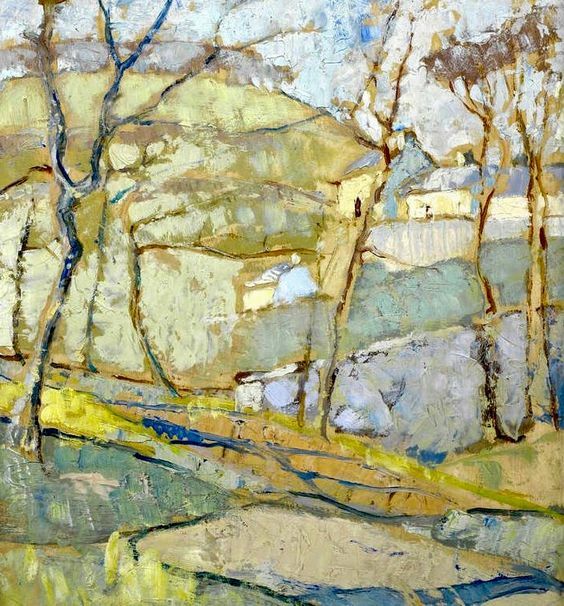 Like the paintings from artists I’ve featured on this blog. 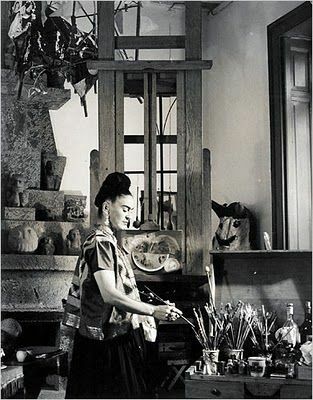 Of course, representational painting in the hands of talented and inspired artists can do the same thing. But I’m not there yet. And these first three paintings I’m posting aren’t there yet either. But they capture enough that I’m pleased with. Enough to inspire me to keep practicing, keep painting. They don’t capture that “something more” I’ve been writing about in one of my last posts on art, the form and the formless. But each hint at it. Something in the shimmer of the sea with the rocks half-hidden beneath. In that white-sand serenity of a turquoise sea. Something deep and dark in the dream-like beauty of those mountains rising out of the mist during our first tropical landfall in the Marquesas islands after thirty days at sea. They hint at, but do not quite capture what I was after. Yet viewing them with the mind’s eye I can still go there and feel it. And that to me is what art is all about.